A mesmerizing fictionnal chronicle of an universal American experience. Through a quartet of four interwoven stories, A CONTRACT WITH GOD expresses the joy, exuberance, tragedy, and drama of life on the mythical Dropsie Avenue in the Bronx. This is the legendary book that launched a new art form and reaffirmed Will Eisner as one of the great pionneers of American graphics. Born in New York in 1917, Will Eisner was the author of the legendary comic strips The Spirit. 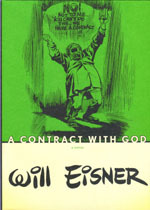 The comic industry's top annual awwards "The Eisner's", are named in his honnor. His other books include Dropsie Avenue and A life force.